The juxtaposition of a young girl and a prehistoric animal is both enigmatic and mythical – beauty meets the beast, but on her own terms this time. While the portrait of each girl shows a distinct individual, these images are united by a common theme: the tension between the future and the past. The girls are standing on the cusp of womanhood raising questions about their future identity-- who will they become? Ancient and venerable, the identity of the lobsters was determined ions ago. They know, and we know, exactly who they are. The girls stand their ground with strength and handle the lobsters with determination: some cradle, some squirm, some raise it aloft triumphantly. 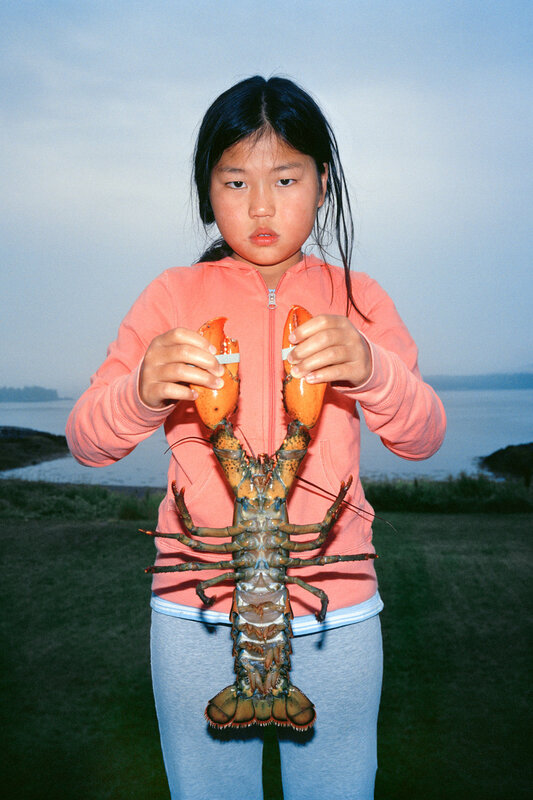 The image of the lobster comes loaded with centuries of cultural tradition, from medieval bestiary books to decades of life in Eastern Canada’s rapidly changing fishing towns. Where once fishermen sold their catches across town, today they ship their lobsters halfway across the world; the town now tries to balance skyrocketing global demand against the increasing threats of ecological change and overfishing. 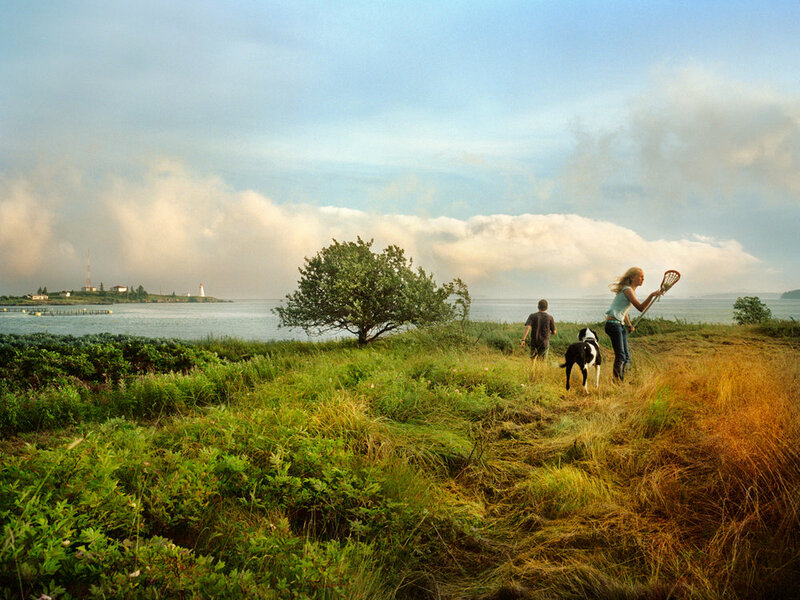 The short maritime summers with long evenings have been cherished for generations. Light bends, time slows, families and friends gather around bonfires as the sun sets and the stars alight. These are the moments between the memories, the fabric that holds the patterns of each summer: wildness and tenderness, sun-glazed cheeks and dizzy laughter. The pillars of the fishing industry are shifting in response to the pressures of overfishing. Independent fishermen now meet the demands of expanding global markets by scuba diving for sea urchins, harvesting periwinkles, and hauling in seaweed and lobsters. © Susan Lapides 2019. All rights reserved. All photographs on this website are copyrighted. They may not be used, reproduced, copied, printed or altered in any way, without specific prior written permission from the photographer. St. George is a fishing town of 2,800 people and not a single traffic light. It is situated on the Bay of Fundy in the Canadian province of New Brunswick. The magnificent bay is known for the highest tides on earth, frigid waters, and dramatic skies. The short maritime summers with long evenings are cherished as a time for gathering around bonfires as they have been for generations. St. George’s economy is based on its thriving farm raised salmon industry. To give you a sense of the scale, Cooke Aquaculture annually sells more than 160 million pounds of Atlantic Salmon. Because the traditional catch of herring or cod has diminished, independent fishermen now meet the demands of expanding global markets by scuba diving for sea urchins, harvesting periwinkles and seaweed, and hauling in lobsters. Being a photographer and new to the Bay of Fundy, I documented our family adventures in this landscape. As friends and neighbors shared antidotes about their home, I recognized it was in flux, and wanted to create a more enduring document to speak to the collective memory of the people and the industries of St. George and New Brunswick.